If you extract downloaded ZIP file you should have the following file structure. CSS folder includes one stylesheet (admin.css). It is used for backend appearance. Documentation contains the plugin’s documentation and its related files. img folder contains the images and icons with different sizes. lang folder will store language files. MO files with appropriate name (e.g. hide_my_wp-en_US.mo) should be located here. 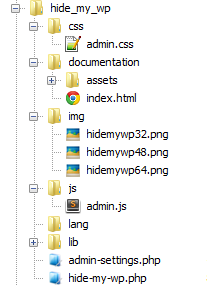 auto_config folder contains code to hide some popular WP plugins. mute-sceamer folder used for IDS. plugin-update folder holds code relate to updating the plugin. class.helper.php is a set of helper functions used in other PHP files. class.settings-api helps us to create our settings page base on WordPress settings API. class.HTML-minify.php for safe HTML compress. class.CSS-minify for safe CSS compress. hide_my_wp.php is the main plugin class. Almost everything will be done here. admin-settings.php used for admin panel settings.